Shanghai’s historic monuments, idyllic parks, and vibrant neighborhoods offer ample photo opportunities, but it can be a challenge to capture the city’s magic on camera. On this private 4-hour photography tour, you’ll benefit from expert tips and advice from friendly tour guide, visit all the best viewpoints, and leave with a camera full of postcard-worthy vacation snaps. Hotel pickup and drop-off is included. I thoroughly enjoyed my photography tour of Shanghai because it was also a good introduction of the city for me. Your guidance gave me a lot of ideas on how I can come back to the locations at different times of the day. I also enjoyed the information about Chinese history and cuisine. The lunch was delicious and now I have ideas on other dishes I can try. Thank you for being my guide! Today may have been a rainy day, but we are glad to had taken this tour. We have gotten more of Shanghai on this tour then expected. Walking through the Buddha temple and they alley was entertaining. Our small lunch of dumpling with noodle was even more amusing with our lack of skilled using chopsticks. We will remember this day when we sit back and look back at all of our photos. 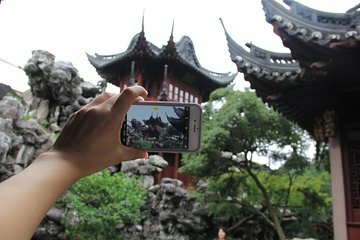 I surely would recommend this tour to anyone coming to Shanghai. Especially who enjoy a private tour. Thank you, Berlin (our guide)! The tour started promptly and we went to all the destinations that we had arranged the day before. It was well paced and I was able to take in all the sights and experiences of each location. A particular highlight was at Fuxing Park and interacting with the locals. It was such a great feeling. It was fortunate for us that there was an unveiling for a new relic at the Jade Buddha Temple and we were able to view it albeit from a distance. We were very privileged. The Jade Buddha itself was also incredibly beautiful and I really enjoyed the view of the temple. After that we went to Yuyuan and to be walking around there after the bustle of going through the bazaar was a relief. It was a classical view of a chinese garden that I really enjoyed. Alana and her driver also took me for a wonderfully amazing lunch which was an experience in itself! And lastly visiting the Bund again was great. The photos that Alana took for me are memories and no selfie could capture those moments. I wish to thank her and the driver (Iâm so sorry I forgot to ask his name) for their kind hospitality and made it a wonderful and comfortable tour or Shanghai. I would not hesitate to recommend this for my other friends who may be visiting Shanghai. A really great way to pack in lots of different aspects of Shanghai sights and sounds into a morning. Would definitely recommend. Snow is the best tour guide ever. She was very friendly beyond belief. She was very patient with describing the tour options, and was very knowledgeable about all aspects of the tour. Prompt, super courteous, and terrific describes Snow. We wish her the best!! I highly recommend Snow for any future tour. This was a wonderful experience for a short visit to Shanghai. We had booked the 4h photography tour and we enjoyed it - our guide Alana had a driver, so she was able to fully focus on our questions all the time. Food at lunchtime were the best fried dumplings ever - a clear five star, like the flexibility, knowledge, kindness and English capability of Alana. When you have a few hours left in Shanghai, please book this tour, they take you to all places you have not seen yet. Thanks from from Tina and Oliver. Interesting tour and my guide (Snow) spoke very good English and very accommodating with intersting stories - Thank you Snow for the nice day. However, this should not be labeled as a photography tour as the guide had limited experience in photography. It’s rather a 4-hour private tour of Shanghai. This tour hits all the highlights of Shanghai. Our guide Alana was very knowledgeable and spoke excellent English. We were able to see all the highlights of Shanghai. Our guide Alana spoke perfect English and her knowledge of the history behind all the landmarks made the trip extremely enjoyable for our whole family. I would highly recommend this tour! Snow, thank you for the fabulous tour. We enjoyed learning about the Shanghai culture and being taken to see fascinating aspects of the city. We appreciate all your efforts to give us a truly customised tour.